It's official: Ted Forrest has his WSOP mojo back. After two years without a World Series of Poker cash, Forrest bested Phil Hellmuth in a $1,500 razz event late last month to claim his sixth bracelet — his first in 10 years. On Sunday he'll have a chance to add another when he and 11 others return for Day 3 of the $1,500 stud hi-low tournament at the Rio All-Suites Hotel & Casino. 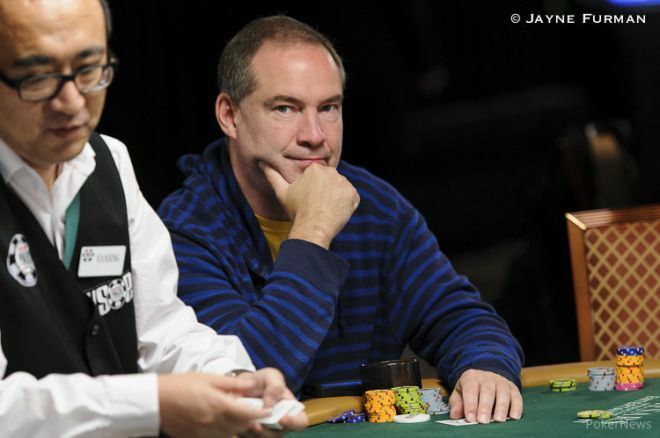 Forrest's resurgence highlights Day 20 of the 2014 World Series of Poker. Twenty-one years ago, Ted Forrest was at the top of the poker world. He made 11 final tables at the 1993 World Series of Poker and won three bracelets, showing off his mixed games prowess with victories in the $1,500 Seven-Card Razz, $1,500 Omaha 8 or Better, and the $5,000 Seven-Card Stud events. To this day some consider it the greatest performance in the 45 years of the WSOP. From there Forrest became one of the most feared players in the biggest cash games in Las Vegas. He added two more bracelets at the 2004 WSOP, joining a short list of players with five or more bracelets. But after 2004, when poker exploded onto the scene worldwide, Forrest hit a dry spell at the WSOP. He went 10 years without a victory and his legendary name slowly faded from the discussion of the game's best players. It's nice to see Forrest's revival here in 2014. With one bracelet already on his wrist, Forrest will attempt to win another when he and 11 others return for Day 3 of Event #30: $1,500 Seven-Card Stud Hi-Low. While Forrest enters the final day in the middle of the pack, Eric Kurtzmann will lead the charge on Day 3 with an impressive 490,000-chip stack ahead of Calvin Anderson (356,000), Sanjay Pandya (307,000) and Joe Tehan (285,000). Others in contention for the $190,538 first prize and coveted gold bracelet include cash game specialist Melissa Burr and 2007 Aussie Millions runner-up Jimmy Fricke. Be sure to join the PokerNews Live Reporting Team from 2:00 p.m. (PDT) on Sunday as play down until just one remains - the Event #30 Champion! A stacked field of 20 returns for Day 3 of Event #29: $2,500 No-Limit Hold'em. Poker pro Jamie Armstrong holds the chip lead entering the day, but he’ll have to contend with Barry Hutter, Chris Johnson, Sam Cohen, Rep Porter, Matt Salsberg, David Benefield, (355,000), William Reynolds. The only bracelet winner in that talented group is Porter, who owns a pair with victories in 2008 and 2011. Armstrong fell painfully short back in 2012 when he finished runner-up in a $1,000 no-limit hold'em event for $273,776. Johnson, Hutter, and Benefield have also been on center stage at a WSOP final table, while Salsberg and Reynolds are attemtping to get there for the first time. Keep it locked to PokerNews.com on Sunday for live updates from Event #29. Also taking place on Monday is Day 2 of the $10,000 No-Limit Hold'em Six-Max Event. A massive $670,041 top prize is up for grabs in that one, and the plan on Sunday is to play down to a final table.